If you have been doing some spiritual soul searching, you’ve found a place where you can wonder with others. If you have been searching specifically for a local Episcopal church, we have almost a century of history in the heart of the Laurelhurst community in Seattle. If you are anywhere in between, you’ve come to a place where you can spiritually search, find ways to serve in community, and celebrate where God is in your life. 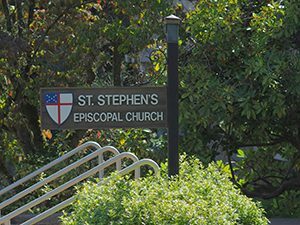 St. Stephen’s is an intentionally inclusive congregation, welcoming all people and their gifts regardless of gender, race, sexual orientation, education, political views, and economic status. We practice mutual ministry – the gifts of the laity being as important and valued as that of the clergy, working together serving God’s people and creation. We are a community of faith in the Episcopal tradition in the Diocese of Olympia in Western Washington and a part of the world-wide Anglican Communion. We look forward to the opportunity to come to know you and invite you to explore our website to get to know us a little bit. Better yet, come visit on a Sunday and connect in one of our community ministries, so you can experience for yourself what life following Jesus is like on our corner of 45th Street NE and 48th Avenue! We look forward to meeting you and discovering God’s work in this world together. Information about our Music Ministry can be found here. First time going to an Episcopal service? Never fear! Here’s a brief guide to help you be prepared. For additional information about all things Anglican (this includes the Episcopal Church), please check out Anglicans Online. The Episcopal church is part of the Anglican Communion, and is comprised of 109 dioceses in 16 nations. At the head of the Anglican Communion is the Archbishop of Canterbury, Justin Welby. Additional information about the Episcopal Church can be found here. Wondering what Anglicans/Episcopalians believe? Here’s a brief explanation from Anglicans Online. In 2017, our parish’s Chapel celebrated 75 years of gathering people to be sent out to be God’s hands and feet in the world. Here’s a succinct history of how St. Stephen’s came to be. Here at St. Stephen’s, we seek to know and love Christ, to know and love the stranger, and to know and love each other. Connect with Clergy and Staff. Connect with the ministry that is where your passion and the needs of the world meet. Let St. Stephen’s support you in times of need. Get more involved in the worship service. Discover the educational opportunities we have for adults and kids. Sign up for our Messenger newsletter for the latest news directly to your inbox. We are on the corner of NE 45th Street and 48th Avenue NE, across from Laurelhurst Park.